Again, this is just a courtesy for those who want a printed copy — the online version remains free. 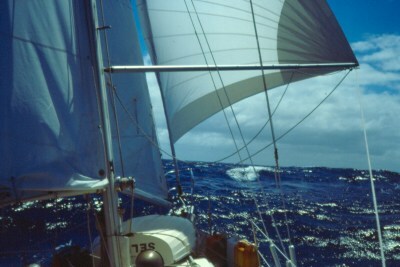 This is a complete, online e-book — an account of my solo around-the-world sail. Select chapters using the drop-down lists, or click the arrows, at the top and bottom of your browser's display. This page set was entirely reformatted and revised in October 2006. The ZIP file contains the new version. Download "Confessions" in ZIP form (1.3 MB) for offline reading. Download "Confessions" in Kindle / e-book form (1.4 MB) for offline reading. Visit my gallery of sailing pictures. [ in a review of "Maiden Voyage" by Tania Aebi posted at amazon.com ] I would recommend "Confessions of a Long Distance Sailor" by Paul Lutus instead of this book. It's written far better, has just as many aventures, is far more education in a worldly and sailing sense, and best of all, it's free. I'm about 55 pages into your book and wanted to tell you it is very good — charming, honest, insightful, a fine, fine story. You should really feel good about it. I have been touched on many levels by your wonderful story. Of course I knew nothing else about you other than the fact that you did what so many of us think we would love to do. I have interrupted my wife's quiet reverie countless times to read aloud a few words that you wrote. Apart from all your other wonderful accomplishments, thank you for this one. I just finished reading "Confessions." Thanks for writing it and making it available for free. I especially enjoyed all the philosophical and scientific tangents you go off on, while keeping everything somehow related to the sea. The last few days, I even had dreams of being on a boat. If I have half as many interesting experiences as you've had by the time i'm your age, i'll be a happy man. I just wanted to thank you for writing such a wonderful book about your circumnavigation ... marvelous! I have started to read your "Confessions" ... I am amazed and inspired.